Amid the global economic crisis, some phone manufacturers such as Gresso, Mobiado and Vertu still gunning all out and announcing the new model of luxury mobile phone. Nokia, the leader in mobility also join them with a new luxury model Nokia 8800 Gold Arte. 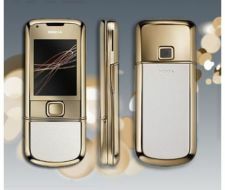 The Nokia 8800 Gold Arte is a new variant in the 8800 Arte family of luxurious mobile phone from Nokia. The 8800 Gold Arte comes dressed in 18 carat gold and white leather. Dimensions: 109 x 14.6 x 45.6mm. Display: 2.0 inch with 16 million colours. Resolution: 320 x 240 pixels (QVGA). Key and Input Method: Numeric keypad, user configurable right soft keys, voice commands and “tap twice” on the front to light up the display and show the clock. Connectors: MicroUSB connector, USB 2.0 Full Speed. Camera: 3.2 magapixel auto focus camera.